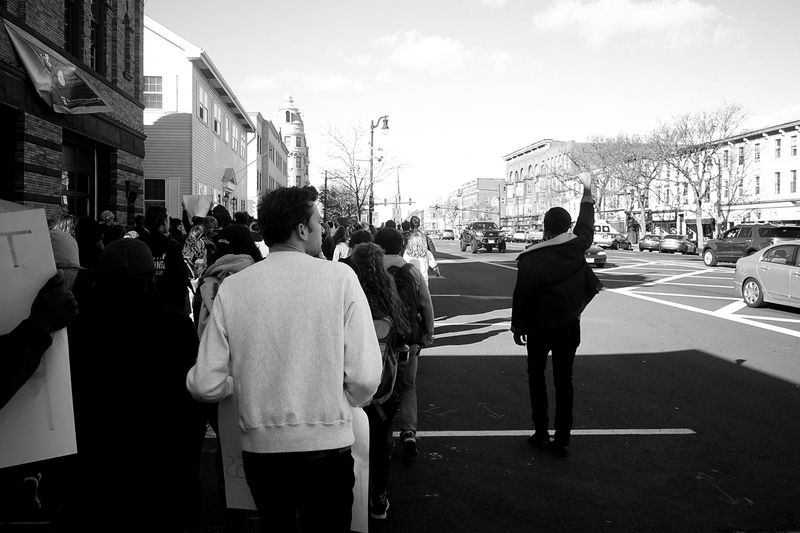 Students march down Main Street on Friday, Nov. 11. Regarding the General Election on November 8th, 2016. On Wednesday morning, I could not write normal-like. At the time, Hillary Clinton led the president-elect by 226,000 popular votes, or just 0.2 percent of those counted; such a small margin it was between all right and the alt-right. By then, she had already lost the electoral college, and with it, the presidency. On day one, there was pain. I felt the weight of 59 million votes threatening to keep me down, telling me that half of this country does not love people like me, like my mother, and Black, Brown, Queer, Trans, Muslim, disabled, female-bodied, and Immigrant people all across it. I still feel this way today. I am less sad about it now. On election night, white supremacy was on the ballot. So, too, were xenophobia, misogyny, sexual abuse, Islamophobia, queer- and transphobia, and fascism. When they won, there was no light to be seen at the end of my tunnel. The White House got whiter. The President’s bully pulpit became much more literal. There was fear. After Brexit, a vote similarly fueled by white nationalism, the United Kingdom saw a 41-percent increase in hate crimes. On day four, public acts of hatred and harassment have been committed against the marginalized nationwide. The fear has not subsided, and I cannot imagine why it would. Words such as respect, understanding, unity, love, political difference, and elitism have since been tossed about. These words have sprung up in calls for respect for the president-elect, his supporters, and their beliefs, for understanding the source of their anger because we cannot afford to ignore it, for unity between the left and the right, the liberal and the conservative, for love and empathy for the president-elect’s supporters. Political difference and a disdain for liberal elitism, not vile hatred, are being credited by some as the guiding forces behind every ballot cast for him. These calls are fundamentally misconceived and misdirected. To treat the president-elect’s agenda as politics as usual dangerously normalizes his bigoted, violent, and criminal ideology just as so-called objective media coverage of his campaign, and now, his transition, has done. Do not ask anyone to respect the beliefs he and his followers hold. To do so is to ask that we respect state-sanctioned violence perpetrated by the police, the continued and expanding suppression of voters of color, a man who has flirted with committing war crimes to make a point, the transition of power from our first Black president to one endorsed by the Ku Klux Klan, a vice president-elect who believes that Queer people can be shocked into heterosexual submission, and a scapegoating of Muslims and Mexicans reminiscent of the Third Reich. This election was not about the difference between liberal and conservative ideologies; the president-elect has defied the common notion that one must commit to either. He is somehow equal parts wall-building spendthrift and budget-tightening conservative. The respect for different opinions being insisted upon is meant for disagreements on questions such as when the Federal Reserve should raise its interest rates, if the federal government should be lean or large, or perhaps even ones like whether or not the minimum wage should be increased. It is meant for people who dislike your favorite food, perhaps. It is not for those who would have Muslims forced to register with the state, or for those who think that the United States should have a president who brazenly bragged about committing sexual assault. With that in mind, the fundamental right to free speech is alive and well—but freedom of speech is not freedom from consequence. Yes, every United States citizen has the constitutionally guaranteed right to be bigoted and to tell the world about it. Though, be forewarned: The targets of bigotry and their allies also have the right to assemble. Their need to do so is a matter of survival. To those who call for peace in protest: While you might be right to advocate peace, these calls seem disingenuous. Remember that the revolution this country loves so much was armed well before the second amendment you fight for allowed you to be. What is to come, not the taxes the founding fathers fought so hard to evade, is true tyranny. Be you bigot or not, your commute will be disrupted, you will be kept awake by the chants of mobile voices reminding us all that people of color will be welcome in this country, and you will know that the presidency to come was born of white supremacy. The complacency and ambivalence most commonly afforded to white people in this country will be met with resistance. Know that the inconvenience of their delayed arrival at work pales in comparison to the harm that will be wrought by the president-elect’s hateful agenda. Know that the president-elect’s victory is demonstrative of the vitality of the United States’ long history of oppression, not its rebirth. I am grateful to know this; though I have known that dark forces are at work to continue the subjugation of all who are not straight, white, and male in this country, my naïve belief in those forces’ coming demise has been shattered. I am less sad about it now—I am fueled by it. Never will I sit idly by in the margins which over 59 million voters would have me relegated to. Never will I help normalize the hatred driving the president-elect and his followers; this publication has a responsibility to follow suit. Never will I stop writing, marching, chanting, and working towards a real reckoning with bigotry within these wildly drawn borders. Never should you, either. Reconstruction will one day come. “Never: (For I Can Write about Nothing Else)” is the introduction to a long-form essay written in response to the election by Devonaire Ortiz. See the second installment: History is a Weapon: The Vote. Thank you for your eloquent, poignant, and inspiring remarks. Except for a small group of Trump supporters, this election was not about bigotry. I voted for HRC but now I regret that vote. Trump was elected by blue-collar “deplorables” to destroy both the corrupt RNC and DNC. Our government hasn’t truly cared about the American people for 50 years. Every establishment candidate during that time, including HRC…hell, especially HRC…was obligated to advance the interests of corporate, Wall Street, special interest, and foreign donors at the expense of the American people. Those insanely lucrative Wall Street speeches HRC gave undermined her candidacy from the get-go. HRC knew she would enter the 2016 Presidential race but she somehow lacked the self awareness to curb her greed to avoid being perceived by voters as utterly entangled with the massive political liability that is Wall Street. Many voters tired of the same old empty pandering of the DNC and RNC believe Trump is a political Molotov Cocktail. If (and I agree it’s a big IF) Trump somehow manages to run roughshod over both political parties to enact policies/laws for the benefit middle and lower class America, and against the interests of the parties’ Wall Street supporters, he will not only spur a massive reboot of the GOP and Democratic parties, he will go down as the most important President of the modern era. Buckle-up buckaroos!